The second round of the NBA playoffs got a little more crowded on Tuesday night, as the Toronto Raptors, Philadelphia 76ers and Portland Trail Blazers all punched their tickets to the conference semifinals. On Wednesday evening, the Houston Rockets joined the others in the postseason's second round. The fourth-seeded Rockets finished off the No. 4 Utah Jazz 100-93 in Game 5 to win their first-round series. They'll advance to face the winner of the Golden State Warriors-Los Angeles Clippers series, which is one of two first-round series still going. That's because, in a surprising twist, the Golden State Warriors couldn't close things out on Wednesday night. 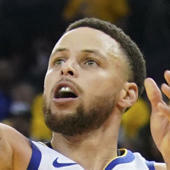 While they didn't blow a 31-point lead like they did in Game 2, the Warriors were once again stunned at home by the feisty Los Angeles Clippers. Led by 57 points off the bench from Lou Williams and Montrezl Harrell, the Clippers withstood a fourth-quarter comeback attempt by the Warriors to win Game 5 and draw the series to 3-2. Here is a look at the bracket, and each team's path to the Larry O'Brien trophy. All games will air on ESPN, ABC, TNT and NBA TV during the postseason. Games on TNT and NBA TV can be streamed via fuboTV (Try it for free).